School holidays are over and packing lunch bo with interesting lunch items is a challenging task for all mothers. And if you have 2 kids, it is even more complicated !! This bhindi rice is an interesting lunch box recipe, recently learnt from my friend who visited here last month. I made little changrs to the recipe to suit my kids taste, and the bhindi pulao is a super hit recipe. 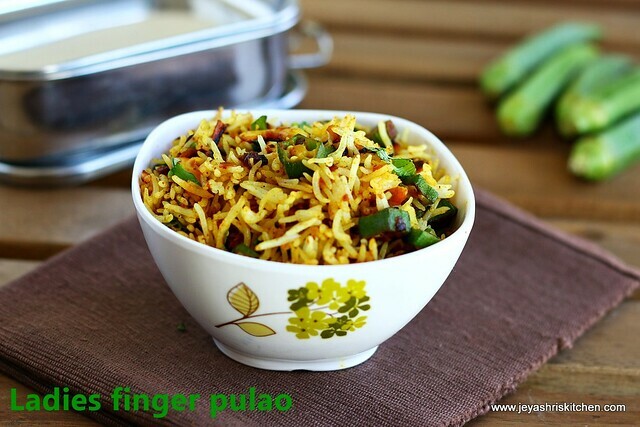 As most the kids love bhindi| vendakai , this bhindi rice recipe will sure be a super hit lunch box recipe. Soak the basmati rice in 3/4 cup of water for 20 minutes. 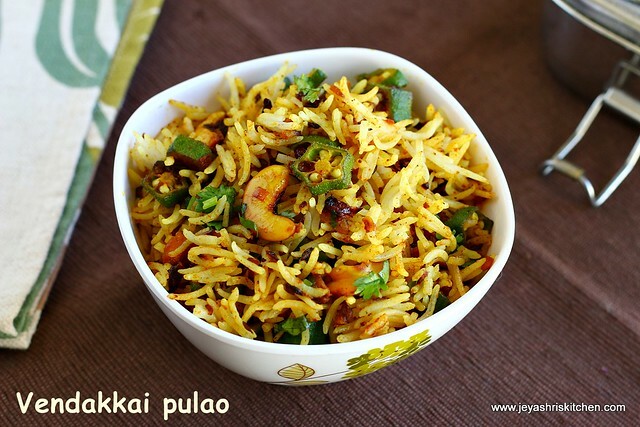 Cook this along with little salt .Check out this how to cook basmati rice post for detailed instructions. Allow this to cool. Cut the ladies finger into thins round slices. In a pan add ginger garlic paste and cook in a low flame till the raw smell goes. Add in the onions and cook till they turn pink. Add in the tomatoes. Cook till they turn mushy. I forgot to add the cashewnuts and so added after adding the tomatoes. You can add when adding the ginger garlic paste. Add the sambar powder, turmeric powder, and pav bhaji masala. Mix this well and cook for a minute and add the cut ladies finger. Cook in a low flame till the ladies finger becomes tender but be careful not to change its colour. Once the ladies finger is cooked, add salt and mix well. Add the cooked rice and mix well. Keep the flame . Cook for 2 minutes and gently mix the rice. Switch off the flame. Garnish with finely chopped coriander leaves. Yummy bhindi rice is ready to pack for lunch box. You can add finely chopped garlic instead of ginger garlic paste. Raw rice| sona masoori rice can be used instead of basmati rice. You can add garam masala instead of pav bhaji masala. This can be made in chinese fried rice style . 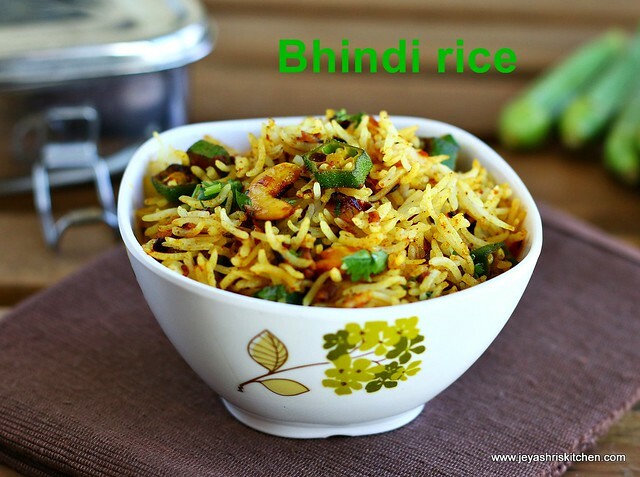 Sarvesh Loves Bindi, This is a wonderful recipe to pack for lunch. Delicious rice ...Thanks for sharing..